Several years ago, Central Connecticut astrophysics professor Kristine Larsen figured out the structure of the solar system from J.R.R. 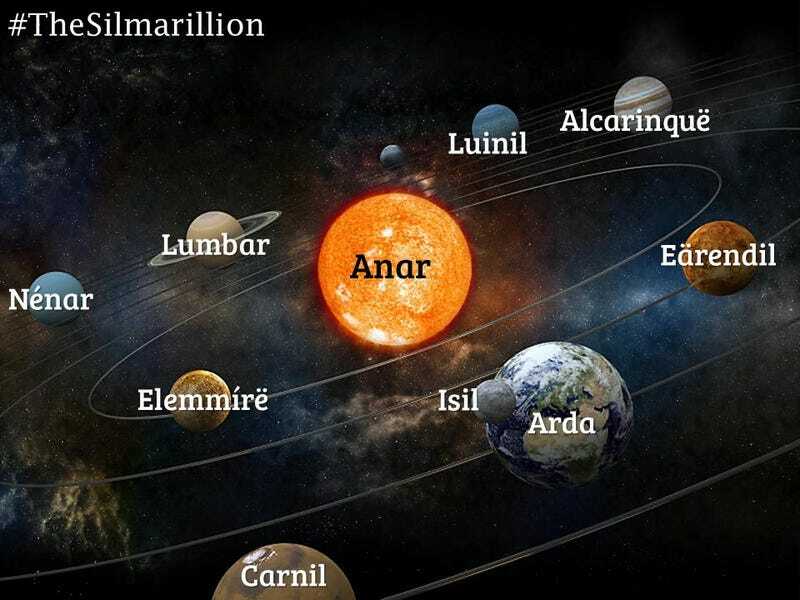 Tolkien's work, using hints scattered throughout the books as well as her own knowledge of Tolkien's source material (which is, not surprisingly, our own solar system). This map shows some of Larsen's findings, though the artist has incorrectly suggested that Luinil and Nénar correspond to Neptune and Uranus. Dec. 22-31 Remain at Caras Galadon, leave with the New Year (Dec. 28 Moon’s first quarter). These chronologies were changed many times, eventually settling on the lunar phases of 1941-2 (although unfortunately many references to the phases of the moon were edited out of the final published version). Tolkien was so "wedded" to his lunar chronology that he sometimes reached impasses in his work. In an April 26, 1944 letter to his son, Tolkien said he had "struggled with a recalcitrant passage in ‘The Ring’," and then went on to say that "at this point I require to know how much later the moon gets up each night when nearing full, and how to stew a rabbit." (TTT). A letter to his son six months later spoke of a "most awkward error in the synchronization… of the movement of Frodo and the others" which temporarily halted progress on LOTR. According to Chris Tolkien’s research, it appears to be a problem with Pippin and Frodo both seeing the same full moon from different locations in Middle-earth, and on what date this occurred. Tolkien’s own notes say "Whole of Frodo’s and Sam’s adventures must be set back one day, so that Frodo sees moon-set on morning (early hours) of Feb. 6, and Faramir reaches Minas Tirith on the night of the 7th…. (This can be done by making Frodo and Sam only wander four days in Emyn Muil). The next night Frodo would see from far away the full moon set beyond Gondor and wonder where he was in the mists of the west…." Read more of Larsen's paper on her website.